Struggling to find the perfect custom kitchen cabinets? 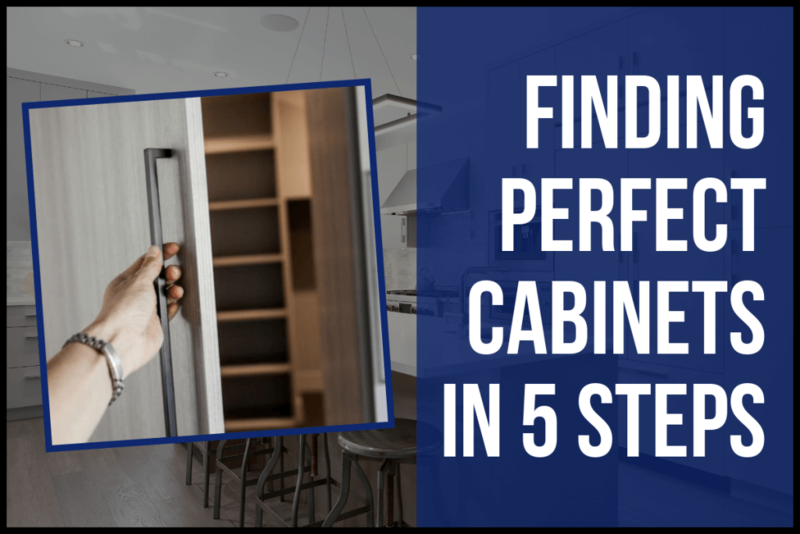 It’s a tough decision to make for most discerning homeowners because your choice in cabinets tends to represent the first and last thing you’ll see when you enter the kitchen. Your cabinets are the face of the space, and give the room its style. Further to aesthetic charm, cabinets house your utensils, dishes, food, accommodate for other storage needs, and take the brunt of punishment associated with heat, moisture and water, and steam while cooking. Durability, functionality, and build quality are every bit as important as style. 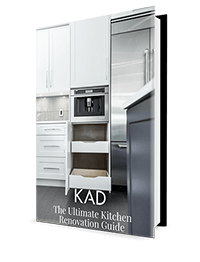 So where should you begin while looking for the perfect custom kitchen cabinets? Whether you’re upgrading your space, renovating the entire kitchen, these tips from our seasoned kitchen designers will help get you started. As the most prevalent and visible aspect of your kitchen, the cabinet door profile is a great place to start when beginning your deliberations. The profile of your door will ultimately dictate the character and style of your entire space. These profile styles can help describe visual identities that help shape inspire the rest of your kitchen renovation design. While some can be quite intricate and complex, slab, for example, is clean, crisp, and no-nonsense style. A raised arch, on the other hand, ushers in a classic design that complements traditional, timeless values. Door profile is a broader term for the overarching aesthetic of the cabinet, but the style of the door itself can further be broken down into specific styles like rustic, craftsman, and both modern and contemporary styles. Door profiles can feature ornate trim work, recessed paneling, glass elements, and distressed framework that contribute to a unique character that’s not easily replicated elsewhere. Getting creative while exploring cabinet door profiles is an excellent way to differentiate your space from the trends of the day and ensure lasting visual charm. Armed with your door profile choice, your ideal budget, consider narrowing your choices down to 4 or 5 styles. Using the process of elimination over a few days time, consider the style implications of each and how they’ll impact your existing space, or how they’ll inform the identity of the rest of the kitchen. Consult design magazines, online style guides from Pinterest, Houzz, and other authoritative interior design blogs to help inform your decision and eliminate options as you decide which won’t fit your lifestyle. When most of us think of our perfect cabinetry style, we typically fill in the blanks and include a material and a general colour scheme. Whether you’re after a classic white kitchen, or you’d prefer to warm up the space with a stained wood finish, the mental picture we cast of our design ideas can be powerful and difficult to overcome when we’re greeted with physical options. Materials play a large role in the cabinetry selection process. A high-quality material means less potential for warping, chipping, nicks and scratches, and will ultimately spell a better investment for your home. At Kitchen Art Design, we pride ourselves on our ability to work with dedicated craftsmen and suppliers who understand the importance of beginning the manufacturing process with a high-quality material. We opt to use ¾ inch melamine rather than the industry standard ⅝ inch to ensure lasting durability, structural rigidity, and strength. 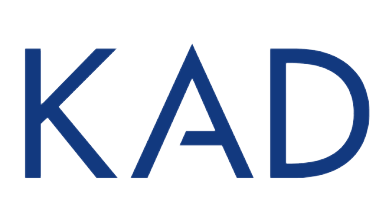 KAD cabinet doors are made from a wide array of high-quality materials including solid wood profiled doors, wood veneers, and high-quality laminate veneer doors, all build upon a hybrid furniture-grade plywood and MDF core, which provides a lightweight, stable foundation. 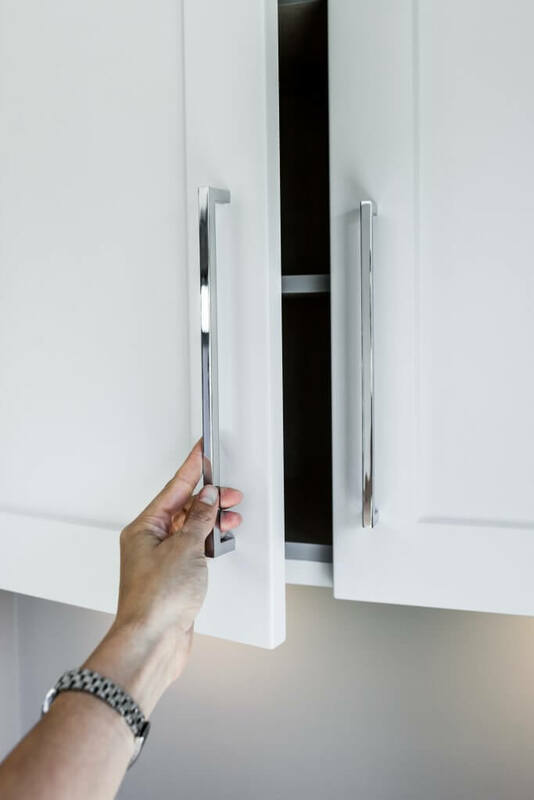 Instead of the industry standard 1/8” thick cabinet back panels with hanging rails, we use solid 5/8” thick back panels for increased strength, and to prevent our cabinets from twisting thanks to changes in moisture and temperature in the room. Colour is next. Picture your dream kitchen in your mind's’ eye: now go with your gut. If you picture a lightly stained natural wood finish - go for it! If you picture frosted glass inserts for your on-wall cabinets and a classic white slab cabinet finish for the island - that’s your instinctual creative vision, and that shouldn’t be ignored. 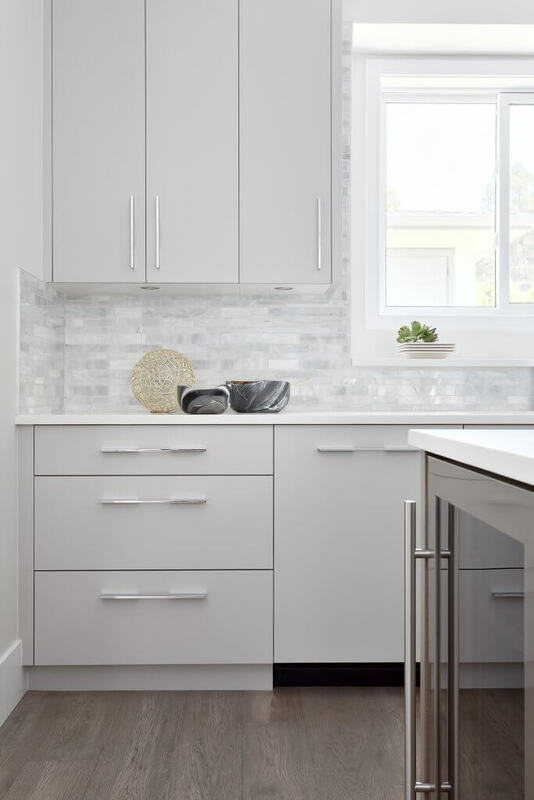 Our team of eloquent designers can help you choose between your ideal cabinet selection options, but we typically urge our clients to shoot for the stars and pick the color of finish that makes them smile. This is your dream kitchen, after all! Cabinets aren’t just a bunch of pretty faces. Functionality and durability are the primary focuses of our business practice, and they should inform your selection process as well. Cabinet doors have to stand up to the tough kitchen environment - a place where boiling water, spills, scuffs, and bangs are commonplace. They also have to be easily maintainable and easy to live with on a daily basis. Think of the number of times you close the utensil drawer with your hip during meal prep every day. Think of times you’ve spilled red wine, coffee, blueberry breakfast smoothie, or tomato sauce down the countertop and onto the cabinet door. Those cabinets had better take the abuse we dish out, so functionality and toughness is a critical aspect of your decision. Next to structural functionality, kitchens are a reflection of your cooking style, your lifestyle, and the spirit of your home. They should reflect how you use your kitchen space, and shouldn’t dictate to you how you’ll use the space. Some people really enjoy having a stack of shelves in the base cabinets, rather than cupboards - others prefer to have a pull-out spice rack near the stove so they’re not running to and fro the pantry during meal prep. These aspects of functionality need to be addressed so your perfect kitchen cabinets aren't just perfect looking and performing - but so they’re functional for you, and how you use your kitchen. Having an organized kitchen to some is more important than the fit and finish of the space. If there’s clutter abound, excess countertop appliances, and no space to store food - there’s no cabinet door on earth stunning enough to ignore the siren song of a kitchen in disarray. Luckily, organization and storage solutions can be as trim, sleek, and crisp as your favourite door profile. Where materials and profile may be the face of the space, storage solutions and good engineering are the bones that hold everything together. Consider exploring the usability of a pull-out butcher block, hidden utensil pantry, spice rack, an appliance garage, or a cavernous storage compartment for pots and pans to eliminate clutter from multiple cabinets. A kitchen that’s able to maintain an aura of organization is a kitchen that’s well planned, well engineered, and oozes wit. Finding the perfect kitchen cabinets is all about breaking down the process into smaller bite-size questions and progressing through the ordeal one step at a time. When you consider style, functionality, storage and organization, and durability - you’re providing yourself with the critical framework it takes to make the most informed decision that’s perfect for how you’ve envisioned your kitchen. You can do this - and we’re eager to help. « How Much Kitchen Storage Do You Really Need?